With injuries leaving Yorkshire short-handed in the bowling department ahead of the start of the Championship season, Ben Coad produced encouraging figures of 2-17 yesterday at Headingley against Leeds-Bradford students (Picture: Tony Johnson). YORKSHIRE have revealed that they will be without pace bowlers Ryan Sidebottom and Liam Plunkett for their opening County Championship match of the season. Sidebottom (left hamstring) and Plunkett (right calf) will miss the game against Hampshire at Headingley on Friday, for which fellow pace bowler Jack Brooks had already been ruled out with a torn left calf. Two more pace men in the form of David Willey and Matthew Fisher are set to step up their recoveries from injury in a two-day second team friendly against Nottinghamshire at West Bridgford starting today. It means that Tim Bresnan and Steve Patterson are the only two frontline pace bowlers who are not injured. As Yorkshire began their first-class season yesterday against the Leeds-Bradford students, dismissing them for 137 before Alex Lees (100) and Adam Lyth (61) helped them to 179-1, club physiotherapist Kunwar Bansil provided the latest update from the treatment table. “Ryan had an issue with his left hamstring early on in Dubai (on Yorkshire’s pre-season tour),” he said. “We are having to manage him carefully and we are looking at possibly the third round of Championship games for him; he’s unlikely to feature in the second round, but we’ll monitor him closely. “Liam has a low-grade calf injury, which he sustained during the MCC (Champion County) game on March 26. On Willey and Fisher, Bansil added: “David had an operation on his left shoulder in February and is slightly ahead of schedule. “He is coming along well and will feature in the second XI on Monday. “Matthew had a niggle in the winter after the Under-19 series and we’re just building him up slowly. Yorkshire, who therefore have five leading pace bowlers injured or making their way back from injury, will have their squad depth tested in the coming days. As such, they would have been heartened by an impressive performance yesterday from 23-year-old pace bowler Ben Coad, who took 2-17 from 15 overs with nine maidens. Coad has made only one Championship appearance for the club – against Durham at Chester-le-Street last June. He would seem to have a strong chance of making his second one on Friday after he was the pick of the attack in cloudy conditions. Martyn Moxon, the county’s director of cricket, said recently that one of his biggest wishes is to see more young players challenge for a first-team place. He was thus delighted with Coad after Yorkshire captain Gary Ballance inserted on a damp pitch. “Ben was very impressive and his lines and lengths were superb,” said Moxon. “He did very well on the pre-season tour and he’s carried that on. He’s definitely a contender (for the first Championship game). Before a couple of hundred spectators, Coad was straight into his work from the Rugby Stand end. He did not concede a run until his 34th ball, by which time he had taken the wickets of Ben Shoare, trapped lbw on the crease, and captain Steve Bullen, caught in the slips by Adam Lyth. In challenging conditions, Coad made the ball talk and was well supported by fellow opening bowler Bresnan, whose first six-over spell cost 12 runs. Coad accepted his sweater on figures of 6-5-1-2 and, after Patterson had Martin Andersson smartly caught off a lifting ball by Bresnan at first slip, Coad bowled another six-over spell that leaked only 12 runs. The students slipped to 57-4 when Patterson won an lbw decision against Peter McDermott, who did not seem overly enamoured with umpire Steve Garratt’s verdict after resisting manfully for over an hour. After the visitors lunched on 78-4, further resistance came from Ollie Graham and Craig Wallace, who took their stand to 65 inside 30 overs before Wallace’s dismissal to a catch at third slip by Jack Leaning off Patterson triggered a collapse. It was the first of four wickets in eight balls as Graham was run-out for the top score of 41, Azeem Rafiq then bowling Will Cook and having Seb Feszczur-Hatchett lbw. The innings ended when Josh Shaw trapped Jack Potticary lbw and then had Oliver Bocking caught at second slip by Lyth. Leeds-Bradford lost their last six wickets for 15 runs inside 10 overs, Yorkshire delivering a disciplined all-round bowling display. When Yorkshire replied, Lees was in particularly impressive form. He made taking runs off the students seem a bit like taking sweets off children. Lees produced a performance of controlled aggression before Graham bowled him in the closing stages to end a 107-ball innings, which had contained 17 fours. 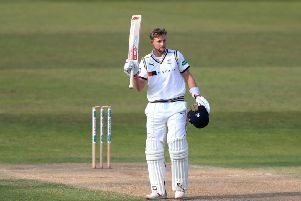 Lees added 174 with Lyth, who also looked in good touch – not least when pulling Cook and Bocking for savage sixes over mid-wicket in the direction of the East Stand.